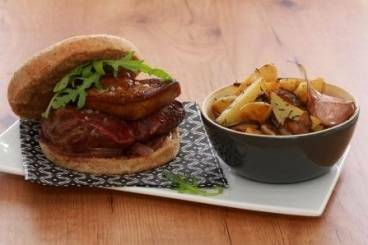 A decadent twist on tournedos rossini: rump steak and foie gras served in a toasted muffin with caramelised red onions cooked with fig vinegar. This burger is served with a helping of sauteed mushrooms and new potatoes. Cut the muffins in half and toast until golden brown. Cut the rump steak in half and season with salt. Cook in a hot frying with olive oil for 2 minutes on each side. Season the foie gras with salt and then cook each slice in a hot, dry frying pan until just golden on both sides. Place on a baking sheet and cook in the oven for 6 minutes. Remvoe from the oven and sprinkle each slice with pepper. Peel and finely dice the red onions. Add a drizzle of olive oil to the same pan used to cook the steak. Once hot, add the red onion and a pinch of salt and cook until soft and golden brown. Add the fig vinegar and cook for a further 3 to 5 mintues. Spoon the onion mixture on to the bottom half of each muffin and place the steak slices on top. Add the foie gras and top with the other half of the muffin. Transfer to the oven and warm through. Crush the garlic clove. Clean the mushrooms, cutting the button mushrooms in half and roughly shredding the others. Melt the butter with the oil and then add the bouquet garni. Once the butter begins to foam, add the potatoes, season with salt and leave to cook over a medium heat for 15 minutes, stirring often. Add the mushrooms and cook for a further 10 minutes. Season with pepper to finish. Serve the potatoes and mushrooms in indiviudal cocottes alongside the burgers.